We spent Thanksgiving with family in Troy Ohio and before going I went online to find coffee shops. Over the four days that we were there we ended up going to three different shops and two of them were an hour away. The first shop we visited was Boston Stoker at 1293 Dorset Road (www.bostonstoker.com) which was only minutes from our hotel. Before travelling I went to their website and saw that they had a cupping open to the public. Because of the holiday I called to make sure they were still having it and they were. So Kim and I left a little early so we could catch it. Joshua, the barista who was leading the cupping is a good teacher and he really made us feel comfortable. He chose an Ethiopian Yirgacheffe and a Costa Rican La Minita for us to cup and both coffees were a light roast. 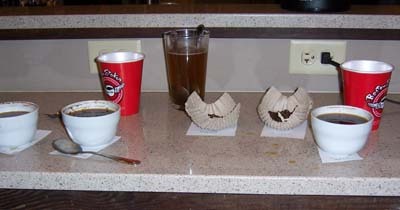 Joshua had a cupping station ready for each of us and we started with the Yirgacheffe. He talked us through each step and demonstrated the process also. It was very easy to follow his directions. He asked us what we tasted and listened as we described the flavors to him. Kim and I both tasted a little citrus and spice. We also thought it had a good body and a good long aftertaste. I wanted to pick the cup up and drink it, it tasted that good! It may be the best Yirgacheffe I’ve had. Then we moved on to the La Minita. Joshua talked us through the cupping process again and asked us what flavors we tasted. He interacted well with us and did not get tired of us asking questions. We thought this one was sweeter tasting and even the aroma smelled sweet. This coffee had a full body and a good aftertaste. To put it simply, it was a balanced enjoyable taste of coffee. Kim wanted to pick this one up and finish it! A couple of days later we stopped and talked with the manager, Kim (it will be easy for me to remember her name) and let her know what a good teacher Joshua was and how we enjoyed the cupping. She took the time to talk with us and told us a little about the company. I also enjoyed a cup of their House Blend Decaf and thought it was very good. You know Kim and I are always on the lookout for a good decaf and this one did not disappoint. 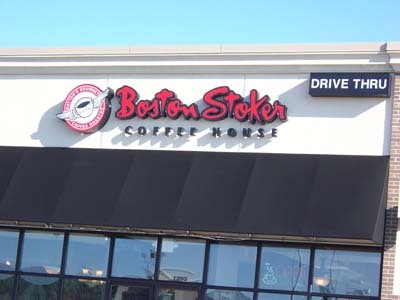 Boston Stoker has nine locations and a roasting facility in the greater Dayton Ohio area. If you are near there and want a good cup of coffee we encourage you to stop. It will be worth getting off the freeway because both the coffee and customer service was great. Remember to stop and enjoy the coffee and conversations. You may find a gem like we did in finding Boston Stoker.